Yet again Snackly have hit the nail on the head in finding fantastic smaller brands. As you all know as a small business owner myself, I have always had a soft spot for supporting smaller, more personal feeling brands. If you are like myself and haven't heard of Honeybuns before, here's a bit about them. Honeybuns is a small Dorset based business which was started in 1998 in student digs! Now I didn't go to uni myself but my brother is currently a post grad student, imagining him trying to bake in a shared kitchen I find hysterical as they are always fighting for oven space so it would bound to end in flour, sugar and butter everywhere! So to me being a start up bakery in student digs is incredibly impressive! They now have a very large social media network, including Facebook, Youtube, Twitter, Pinterest, Blogs and an online shop. You can also purchase their baking book, if you want to try and be creative in the kitchen yourself! On another note their packaging is biodegradable so for those of us that are conscious of the environment and think the mini's contain a lot of packaging, this has already been thought of and catered too! 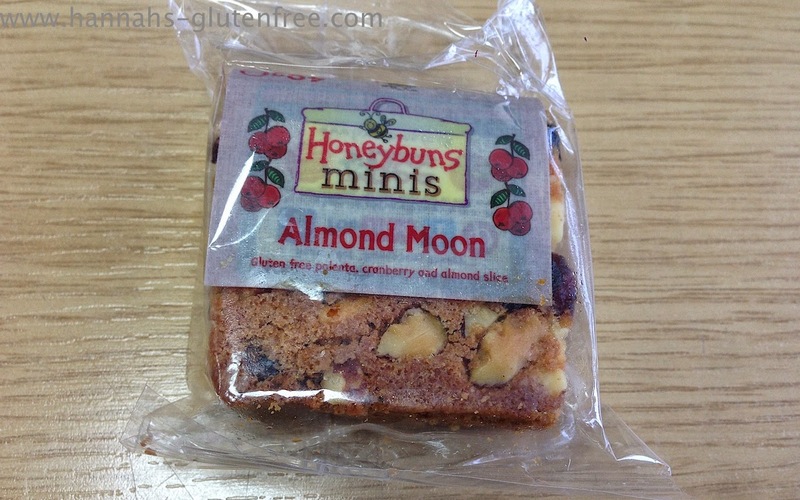 Today I am going to be reviewing the Almond Moon Mini that was sent out in the Snackly box. This slice was a bite size style which is right up my street, having a large slice in one go does overwhelm me, so these pre portioned smaller slices that I don't have to cut down means that I can throw it in my bag for work and I don't have to worry. These Mini's retail for £1.05, which I think is good value for a smaller brand and the quality of ingredients. Being able to try a variety of flavours without the fear of them all going bad before you get to finish them is something I really enjoy as I hate wasted food! But if you do fall in love with a flavour you can buy a larger slice for £1.70 which could be cut down to bite size. Or you can opt for a whole tray bake for a mere £6.70, there's even a large tray bake for £17.15, which could also be fantastic for family gatherings and parties. 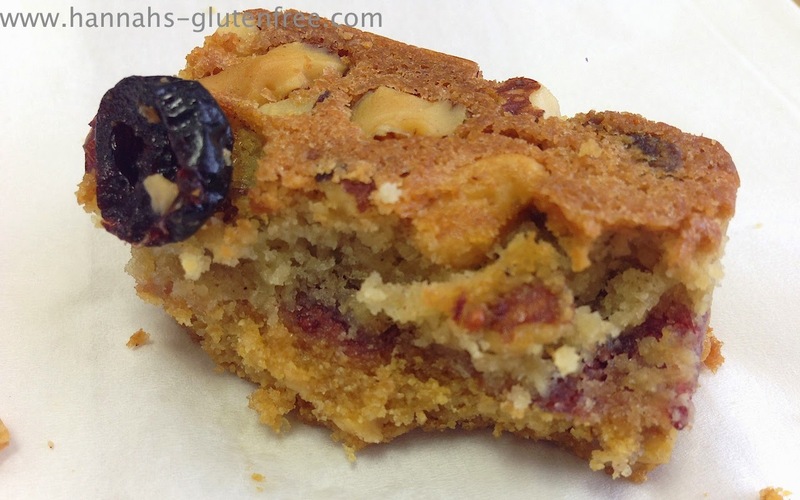 The flavour of the Almond Moon is incredibly similar to a cherry bakewell, which I do find interesting as this slice contains cranberries rather than cherries. I put it down to the almond base, which is also a prominent feature of cherry bakewells and that could make the cranberries translate as a slightly cherry taste as both are red fruits. The slice itself has a biscuit crumble base, similar to a homemade cheesecake, with a thin layer of a thickened cranberry sauce in the centre which is almost a jam in texture. This is layered with a luxury crumble style topping. This consisted of large chunks of almonds and slices of dried cranberries. The slightly more crumbly mixture and the thick sauce held each other together well and complemented on another in taste and texture. I love almonds but I do think they are quite a dry nut in flavour and are not very oily, so combining this with the thick sweet cranberry sauce made the flavours blend together well. 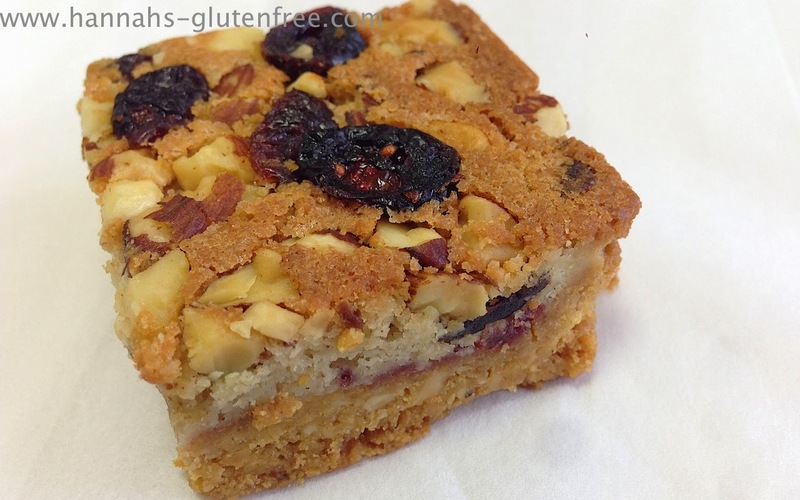 I am definitely very interested in trying more from Honeybuns as I really enjoyed this slice and I think is one of the most unique gluten free cake slices I have had in a while and for that reason I would 100% recommend trying this slice as I think you'd love it! Things I miss being Gluten intolerant! McDonalds the gluten free way!